Uroš Rojko (Ljubljana, 1954) studied composition and clarinet in Ljubljana, then composition with Klaus Huber in Freiburg and Györgi Ligeti in Hamburg. 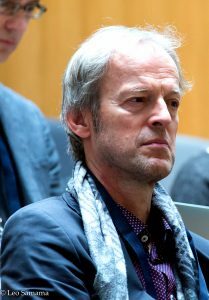 His compositions received many awards, among which Alpe – Adria Kompositionspreis 1983; Premio Europa, Rome 1985; Wiener Internationaler Kompositionspreis 1991; Župančič Art Prize of the city of Ljubljana 2014; and more. He was commissioned for new works by Donaueschinger Musiktage1988, Radio France-Paris 1999, Warschauer Herbst 2007, Ensemble Modern, National Youth Orchestra of Great Britten (NYO) and BBS London, and many more renowned festivals and performers. He is still active as clarinettist, solistic and in chamber music groups, with a focus on contemporary music. Since 1995 Rojko holds the chair of Composition at the Music Academy in Ljubljana, and he is a member of the Slovenian Academy of Science and Arts since 2015. He divides his time between Ljubljana, Vienna and Berlin. Ognjeno Morje | poem: Dragi mi !